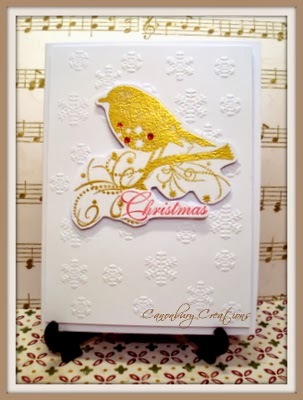 Hi everyone, well this week's challenge over at LIM is Christmas cards, which is good as I have been making a few over the last week. My first card just uses an EF and an SU sentiment, but it was difficult to get a good photo as I used some gilding wax on the embossing and it looks strange in the photo but not IRL! I added some liquid pearls on the corners. This one is again embossed and the stamp is a Sue Wilson one that I picked up at Ally Pally embossed in gold, which looks horribly yellow in the photo unfortunately. Finally I just wanted to share a card that I made for my SIL's birthday last week. 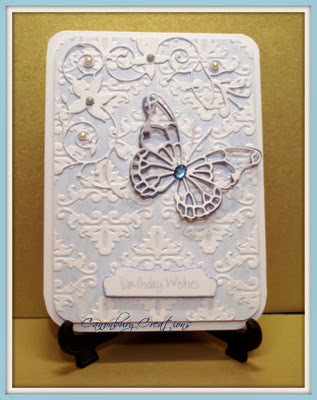 I was inspired by some cards that Viv made using the belleek technique, which gives such a pretty effect. We were singing yesterday at the Hampstead Xmas fair which is always a great atmosphere and luckily the weather held up for us. Thanks for taking the time to visit, your comments are always welcome. what a beautiful set of cards, val!! the birthday card you made for your SIL is stunning! Lovely cards Val and thanks for the mention! Your birthday card is beautiful and am sure your SIL loved it! From the 2 birdie cards I can't choose a fave - both fab =- and am thinking now will have to add gilding wax onto this wish list which now when unrolled goes halfway down the street! Beautiful selection of cards, it would be hard to mention a favourite. Three lovely cards Val. I'm sure thst Mary will love her card. Glad that the Hampstead Christmas Fair went well and the weather was good. You have been busy, Val, and how really pretty they all are. 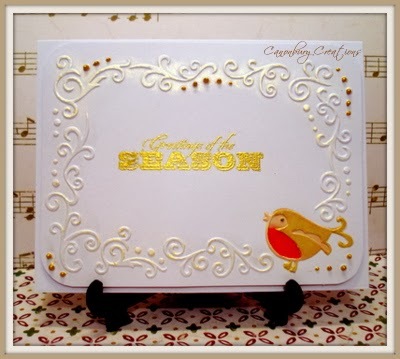 The frame and bird you gave your sentiment on the first card are gorgeous. The second is so pretty and cheerful, and the last one is so elegant! Your SIL loved it for sure! What a keeper. Very fun card designs Valerie.